After many years of geographical and bibliographical journeys, William Panczner has completed a project that many of us would have loved to initiate, but did not undertake because of its magnitude and intrinsic complexity. Not since L. Salazar Salinas, who is credited with authoring Bole tin numeros 40 and 41 (lnstituto Geologico de Mexico, 1922, 1923), has an author been able to provide readers with a comprehensive volume containing information that is both authentic and reliable on Mexican mineralogy, mineral species, and localities. 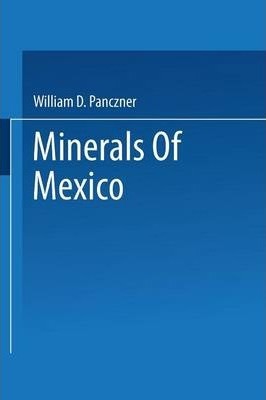 This volume is the most complete synthesis about Mexican minerals and their occurrences to date. It is richly illustrated with photographs and drawings, is well documented, and is organized into four sections, making it easy to use and enjoyable to read. The introduction contains an interesting summary of the mining history and the development of mineralogy. It also describes, in a condensed but accurate and stimulating manner, the geography and the mineralogy of the country, dividing it into eleven mineral provinces. The author discusses eight of the more important mining districts in Mexico, which produce fine mineral speci- mens. There is also a chronology of historical, geological, and mineralogical events in Mexico. This is followed by a bibliography with over 500 references on the subject. Illustrations note 27 Illustrations, color; 45 Illustrations, black and white; XV, 467 p. 72 illus., 27 illus. in color. Important Mining Districts.- Discovery and Developments in Mexico.- Catalog.- List of Entries.